Includes every standard glass color that Bullseye makes for kilnwork. Four volumes in sturdy shelf cases. Includes: Thins and double-rolled sheets, iridescents and textures, plus a sampling of accessory glasses (frit, stringer, confetti, rod). 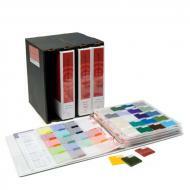 Over 475 separate samples - a range unsurpassed in the market. Note: This set does not contain Cascade styles.